What is in a name? 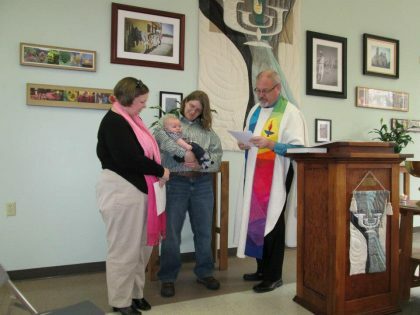 Naming Ceremonies are blessings and covenants.The minister will create the child dedication or naming ceremony that best meets your spiritual needs. A selection of possible texts for naming ceremonies used in our congregation are gathered below. In the ceremony congregants are invited to write their own blessings for the child and these are read during the ceremony. We wish you beauty in life and strength of mind, body and spirit. We wish you empowerment for self and compassion for others. We wish you a strong sense of honour, with humility to recognize strengths beyond your own. We wish you the gift of joy and laughter, and reverence for all the wonders of the Universe. [i] “how to love a person” © by AJ Tigarian. Printed here with permission. Permission is given by the author to use this poem in other naming ceremonies with acknowledgement of the author. [ii] This last section is a wildly loose adaptation from a section of a naming ceremony written by Lutheran priest Nadia Bolz-Weber http://www.patheos.com/blogs/nadiabolzweber/2012/01/liturgical-naming-rite-for-a-transgendered-church-member/ While there is sufficient changes in wording of the final three sentences to stamp Rev. Fred L Hammond’s name to it, the origination of the idea is unmistakably the Rev. Nadia Bolz Weber’s. And at Rev. Nadia’s site, credit is given for the naming ceremony there as being adapted from one used by Episcopal Priest Michele Morgan. There is an evolution of adaptations going on here.